What is a family? Once, it was said to be a father, mother, boy, girl, cat and dog living in a house with a garden. But as times have changed, families have changed too, and now there are almost as many kinds of families as colours of the rainbow. 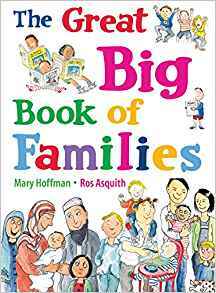 In a truly intercultural and intersectional book, Hoffman and Asquith offer an exploration of families and the very many different things they do: holidays, hobbies, school, clothes, and food and the different ways that different families approach them. The book challenges preconceptions by breaking the way in which most children’s books portray the typical home arrangement with witty and sensitive captions accompanied by vivid and brilliant illustrations. The book has become a firm favourite with children as they will be able to find something to match their circumstances. It is a great asset for encouraging equal opportunity discussions.